EPA Regulations Give Kilns Permission To Pollute Cement plants, like Ash Grove in Chanute, Kan., burn hazardous waste for fuel, causing anxiety for nearby residents despite assurances of regulators. Toxic air pollution persists in hundreds of U.S. communities. 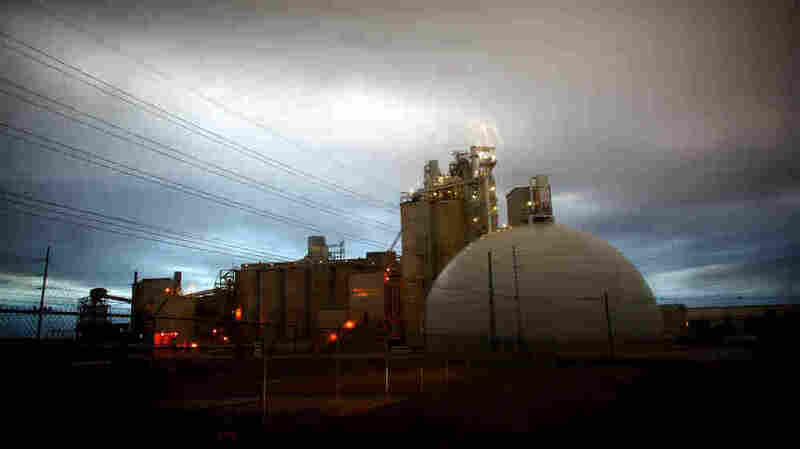 The Ash Grove Cement factory, which burns hazardous waste for fuel, is in compliance with EPA pollution standards. Part three of a four-part series, Poisoned Places: Toxic Air, Neglected Communities. The smokestack stands more than nine stories above the southeastern Kansas prairie and the small city of Chanute, and it's bright, white flashing lights are like a beacon in the night sky. "In the wintertime when the leaves are off the trees you can see that," says Ken Lott, 71, a pecan farmer and Lutheran minister with a farm two miles northeast of the stack. "I tell people that that's my Christmas tree over there because it really looks good." But for Lott and for people in communities across the country, smokestacks like the one in Chanute provide mixed messages. They signal some of the best-paying jobs around (137 people in Chanute), funding for community projects and revenue streams for local governments. Sarah Harris wrote about the Galemore family for Slate and The Center for Public Integrity and adapted her story for NPR. Many also emit toxic air pollution affecting millions of Americans as NPR and the Center for Public Integrity have documented in a joint investigation. In some cases, companies fail to meet pollution standards and regulators fail to respond quickly. But the Ash Grove cement plant in Chanute, a town of 9,000 people, and its skyscraping smokestack have not run afoul of the law or the state and regulators who enforce it. The plant does not appear on Environmental Protection Agency lists of facilities requiring urgent enforcement or extra scrutiny. "The plant is in compliance," says Karl Brooks, the regional EPA administrator. "We have a standard and we comply with it," adds Curtis Lesslie, an Ash Grove vice president, as he stands on a steel, wind-swept platform just below the top of the smokestack. Below him, the massive fiery cement kiln spins. The kiln burns hazardous waste for fuel, which concerns some people living downwind despite the assurances of regulators. They've pleaded with state and federal officials for help, in tense and testy meetings. John Galemore, 74, who owns an oil business in Chanute, has pushed regulators hard. "We have no other protection than you people," Galemore told them. "You're our front line and our defense. And all we're asking is that you assure us with testing that we're safe." Lott also attended the meetings. "They are not watching closely," he says of the EPA and the Kansas Department of Health and Environment, or KDHE. "They are not sampling the air coming out of their smokestack." Regulators have resisted, citing Ash Grove's compliance with pollution standards. But those standards give cement kilns permission to pollute when they burn toxic junk for fuel. Kilns are legally allowed to pump more toxins into the air than are hazardous-waste incinerators, which burn many of the same dangerous materials, including industrial solvents, aluminum plant waste and other toxic leftovers from the production of chemicals, oil and pharmaceuticals. 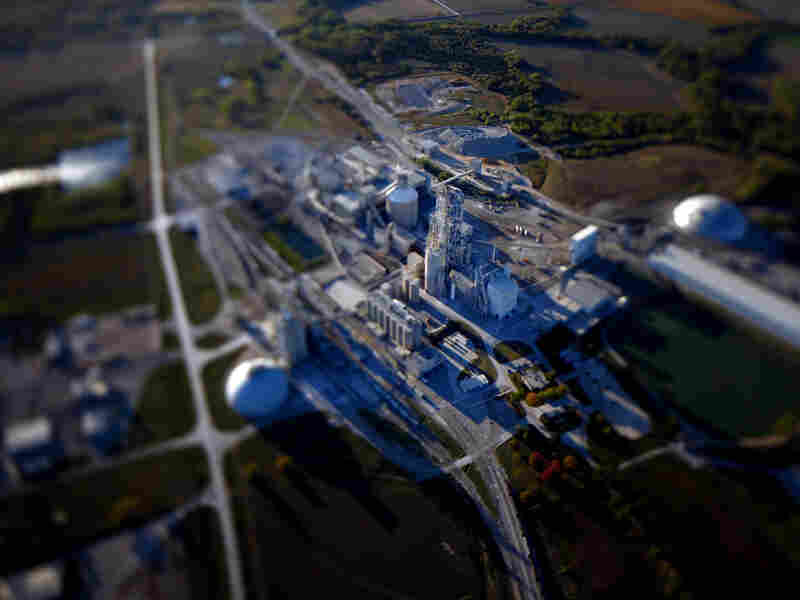 The Ash Grove Cement Kiln, as seen from an aerial photograph, sits on the northern edge of Chanute, Kan.
"The problem with cement plants that burn hazardous waste is that they're not designed to burn hazardous waste," says Jim Pew, a lawyer for the environmental group Earth Justice. "In my view it's a loophole for the cement industry." Kilns like the one in Chanute that were built or rebuilt before 2005 can emit 43 percent more lead and cadmium — close to four times the hydrogen chloride and chlorine gas, and twice the particulates — than actual hazardous waste incinerators. Thirteen cement kilns in six states operate under those standards. Three newer or upgraded kilns can emit even more toxic pollutants under EPA standards, including 18 times the lead and cadmium and 15 times the mercury. These elevated levels are not harmful, says the EPA's Brooks, because federal pollution limits are "set with a margin of public healthy and safety." The industry considers the safety margin huge — "far lower than what is necessary to protect human health and the environment," says Mike Benoit of the Cement Kiln Recycling Coalition. The numbers are deceiving, he adds, and the actual emissions are minuscule. "We're talking about nanograms," Benoit continues. "We're talking about micrograms. Millionths of a gram — billionths of a gram." But tiny measurements can add up, especially when it comes to mercury emissions at Ash Grove. "In the year 2004, for example, the Chanute plant was the second-largest emitter of mercury in Kansas," says Craig Volland, an environmental consultant who advises the Kansas Sierra Club on air pollution issues. "Mercury is a very insidious pollutant," Volland continues. "So any additional mercury that's emitted from any facility has the potential to increase the health impact." EPA air records show that the Ash Grove cement kiln in Chanute emitted more than 500 pounds of mercury a year in three of the past 10 years, when the plant was operating at capacity. Total mercury emissions for the past decade top 3,000 pounds. "That would compare to the 170 pounds of mercury a year at a major coal-fired power plant," Volland adds. The EPA itself is aggressively attacking mercury. Last year, the agency proposed tough standards for mercury that would reduce emissions by 92 percent at conventional cement kilns. "Mercury can damage children's developing brains," the EPA says in a 2010 news release. "Mercury in the air eventually deposits into water, where it changes into methyl mercury, a highly toxic form that builds up in fish." Volland says that any additional mercury emitted from facilities can increase the health impact. "In many freshwater lakes in the United States, we've already reached the threshold of harm of methyl mercury in fish tissue," he adds. The formula begins with what the least polluting kilns can actually achieve given the pollution control technology available when the standards were set. So, if the cleanest kilns in the bunch are relatively dirty than the standards permit more pollution. The standards are not based on what might be desirable or what might be possible with new pollution controls. Then the precise mixture of hazardous waste is considered, along with operating conditions of the kiln, emissions measurements during occasional test burns, and computer modeling that estimates exposure to people downwind. If enacted, the EPA's new mercury standards for cement kilns would not apply to kilns that burn hazardous waste, given the special category of regulation Congress carved out for them alone. Despite the EPA's expressed concern about mercury, the agency's Brooks seems unconcerned about mercury emissions at Ash Grove. "Every test that's been done," Brooks says, "every inspection that's been done verifies that there is full compliance with every relevant part of that permit, including the mercury part." Compliance is based on a very complicated, arcane formula that is difficult to digest, except, perhaps, for the small circle of industry experts and regulators fluent in the nuances. Regulators say nearby residents are safe if they stick to the formula, but that doesn't satisfy Jeff Galemore, 53, who works in his father's oil business. "The reason I don't trust it is they've battled us so hard on the testing," Galemore says, as he drives his white Dodge pickup through his Chanute neighborhood, pointing to house after house. "This person right here has cancer," he says. "His granddaughter has cancer. This gal has cancer. ... The one across the street from where I live has cancer. Two houses south of me has cancer. But they repeatedly tell us there's not a problem." In the back seat of the pickup, Galemore's sister, Selene Hummer, 51, believes she has the explanation. "The government has to have someplace to dispose of this. So they're not really going to hammer away at somebody, because they've got to have some place to put it," she says. That's a reference to the nation's hazardous waste crisis more than 30 years ago, when buried toxic junk and serious illnesses forced the evacuation of an entire neighborhood at Love Canal in upstate New York. Burial of hazardous waste was banned, and incineration was considered the only viable alternative. Specially designed incinerators were expensive and took time to build, and cement kilns were already operating with the kind of heat that could destroy toxic waste. As a bonus, kilns were paid to take hazardous waste, so they could replace expensive fuel oil and transform fuel costs into income. The industry and the EPA refer to the process as recycling because the kilns "recover" the energy value in the waste when it's burned. "Why would it ever make sense to throw away a material that has significant energy value if you could use it as a fuel and a replacement for fossil fuel instead?" asks Benoit, of the Cement Kiln Recycling Coalition. At first, cement kilns burning waste were largely unregulated, but by 1996, the EPA had developed rules. Ash Grove became the first cement kiln in the country to receive a hazardous-waste permit. There was some concern in Chanute, but there have also been voices in the community strenuously defending the company. "I do not have a high level of concern because I trust the regulators," says J.D. Lester, Chanute's city manager, who calls Ash Grove a model corporate citizen. "And I just don't, at this time, feel like that threat exists." But trust is an issue for skeptics because of a perceived coziness between industry and regulators in Kansas. An email exchange obtained by NPR illustrates that perception. Last year, when the EPA announced its proposed emission standards for cement kilns, William Bider, the Kansas director of waste management, reached out to Lesslie, Ash Grove's vice president. Lesslie predicted "extreme impacts on the industry." Bider then wrote to two colleagues, including one heavily involved in Ash Grove matters, that the EPA's new standards "will help put our cement plants out of business... EPA is out of control as far as I'm concerned." Lesslie is a former state regulator. He drafted the company's first hazardous-waste permit 15 years ago and spent seven years with a consulting firm before moving on to Ash Grove. NPR provided a copy of the email, which was obtained from state records, to John Mitchell, Bider's boss and the director of the environment division at KDHE. "It disappoints me to see our staff putting something like that in writing," Mitchell said in an interview, while asserting that Bider expressed his personal opinion. "Our position certainly is that if changes come down the pike, we will consider those ... as we regulate the businesses in Kansas. I have no doubt in my mind." NPR then asked Mitchell why concerned people in Chanute would trust a key state regulator, who was so openly critical of the EPA, the state's partner in Clean Air enforcement. "We don't always see eye to eye on everything," Mitchell said of the EPA. When shown the email, the EPA's Brooks would say only that "KDHE has held up its end of that partnership bargain." Volland says the email is "crossing the line a bit" but also says "KDHE is always under enormous pressure from the politicians in Kansas, who are very conservative. ... [Regulators] are always being pressured to be accommodating to the industries that they regulate." The persistence of concerned people in Chanute prompted KDHE officials to respond. First they updated a review of health records in the area and found no excessive rates of cancer. Some in the community don't trust that assessment, claiming many people seek cancer treatment at distant hospitals in big cities. 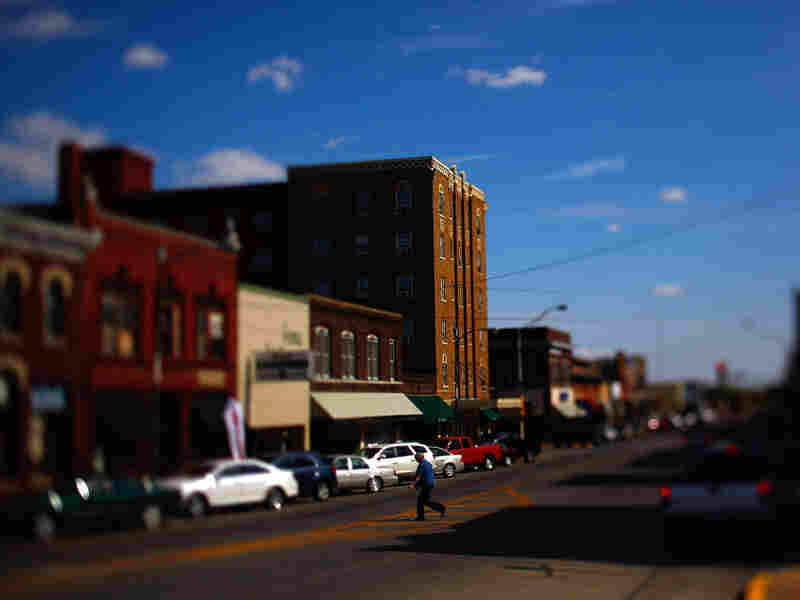 A pedestrian crosses the main street in downtown Chanute, Kan. But the study identified higher-than-expected rates of treatment for asthma in the Chanute area. State officials also looked back at a 2006 sampling of fish in the creek that runs right past the Ash Grove plant and noted elevated mercury in one sample. So they decided to conduct independent testing of air, water, sediment and fish in Chanute. KDHE's Mitchell is confident the new testing will show there's no cause for alarm. "We've done far more here in Chanute to investigate the concerns that these folks have had than we typically do based upon the lack of concrete documentation that there's an existing problem," Mitchell says. "If we really don't find some sound scientific basis to delve deeper it's very hard for us to do more." Brooks predicts the testing will allay fears in the community and resolve questions about the validity of the EPA standards. "You'd like to make sure that everybody affected by emissions from a permitted facility understands what's being emitted and has some confidence that the permit is doing what it's designed to do," Brooks says. "That would be the hope, that the evidence that's supplied to people will give them that confidence." The testing began this summer. It's not clear when results will be available. In the meantime, the cement kiln at Ash Grove in Chanute will be silent and the smokestack unused for an indefinite time after New Year's Day. The plant will shut down because of weakness in the cement market. In recent years, the shutdowns have lasted a few months. NPR's Sandra Bartlett, who produced this story for radio, contributed to this report.